Khuon Sodary, the second vice-president of Cambodian National Assembly, said at the 139th Assembly of Inter-Parliamentary Union (IPU) that Cambodia respects multiparty liberal democracy, holding free and fair elections that allow citizens to choose their leaders. The General Assembly was held on 16 October 2018 in Switzerland to discuss the legislative leadership to promote peace and encourage innovation and technological changes in the new era. According to Sodary, about 7 million voters participated in the Cambodian National Assembly member elections, an equivalent to 83.02%. In particular, 539 international observers from more than 50 countries, including international organizations, ASEAN political parties, ASEAN assembly, the ASEAN Inter-Parliamentary Assembly and the European Council on International Relations, observed Cambodian electoral process. 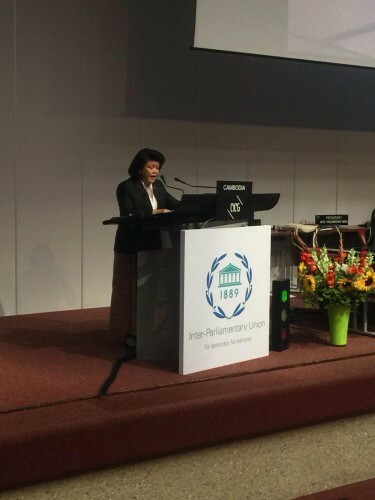 She said that the Cambodian Parliament stands ready to promote peace and development in the modern era.